Microsoft Office: How to download and install Office 365. 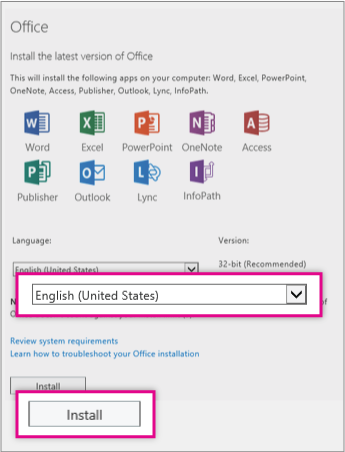 On the Office page, select a Language, and then choose Install. Now you're ready to start using Office. In the Windows 8 start screen or on the Windows 7 start menu, type the name of the Office application you want to use, like Word, and open it. See Can't find Office applications in Windows 8? if you need help finding the apps after installing Office.